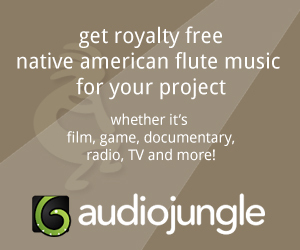 For a person who learns how to make Native American Style flute, photos are one of the best educational resources. 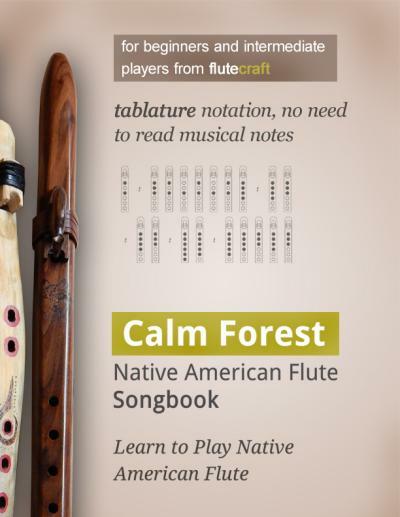 By looking at the elements of the flute made by other makers, you can easily learn what to expect and what should you make yourself. 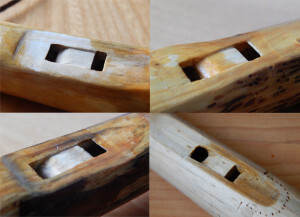 Today I explain 5 photos of flute’s nests – this is where the sound mechanism is located, and this is the heart of the flute that makes the instrument make sounds. 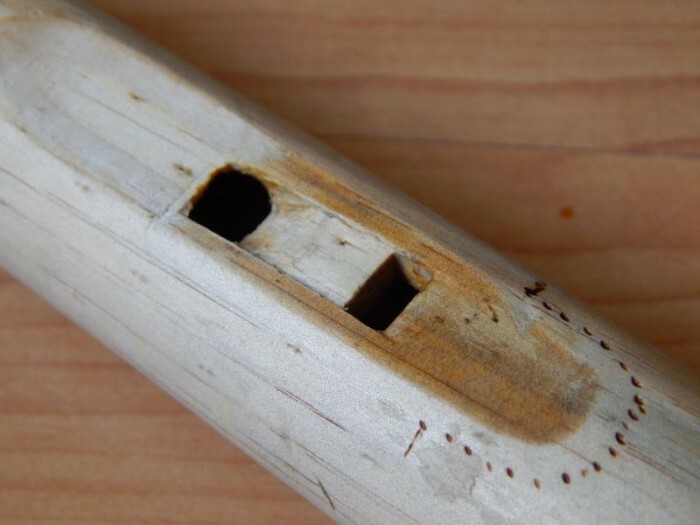 You should remember that Native American style flute has two chambers – the first one is called Slow Air Chamber – from it, a hole leads into the air channel, that directs the air stream into the True Sound Hole with a Splitting Edge – this is where the sound is produced. The entire sound mechanism area is often called “a nest”. Basically, the holes can be round or square, the air channel can be placed within flute’s body, or within flute’s block. 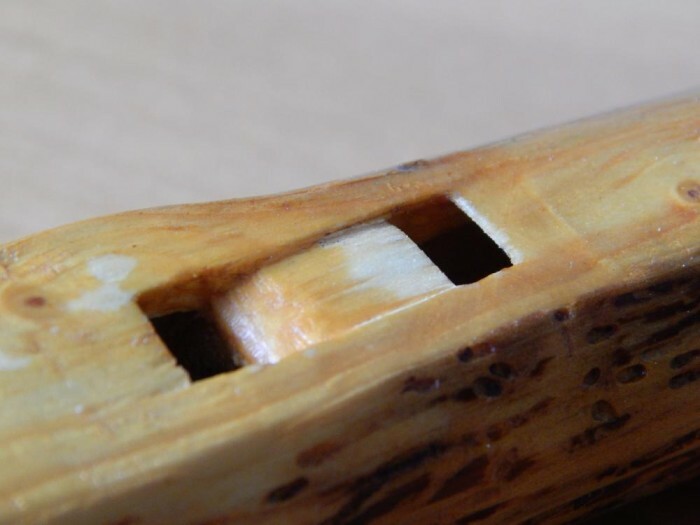 Let’s start with some branch flutes and air channels built into the flute’s body. Example of a branch flute’s nest. On the photo above, you see a nest area of a branch flute I made some time ago. The air channel is made into the flute’s body. The air channel can be made either with flat chisel, or with a router bit. Personally, I use chisels :). 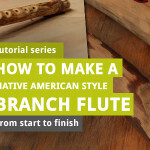 Check the list of basic tools for making Native American style flutes at home. The True Sound Hole’s splitting edge is sanded down from above, too. Every splitting edge is (or at least should be) sanded from the bottom at 45 degrees angle. But when you make an air channel within flute’s body, and not in its block, you need to sand down the splitting edge from the top, as well. Otherwise, the flute may sound airy or it may be very silent. This is because the air stream must hit the splitting edge properly and the air must be splitted equally. If you wonder why some areas of this nest are yellow while other areas are white – well, first I laquered the flute with some shellac, but later on I needed to make some fixes, thus the laquer has been sanded down a bit :). Another nest in a branch flute. 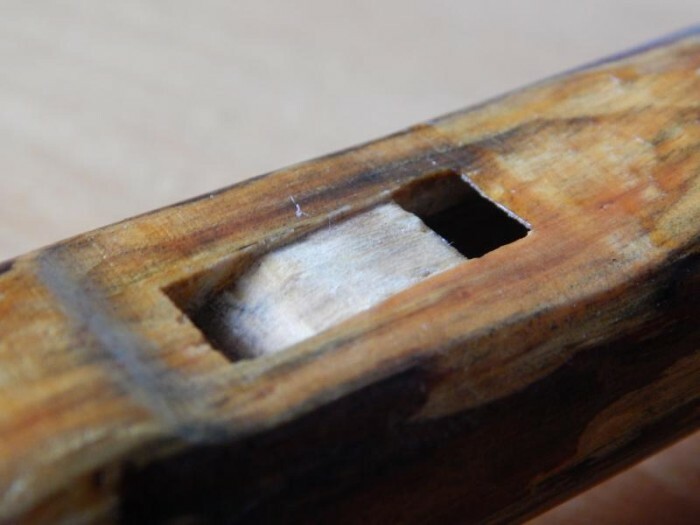 On the photo above you can see exactly the same situation – the air channel is build into the flute’s body, so the splitting edge is sanded down on the top, as well. Once again, a nest in a branch flute. The photos above illustrate that the sound mechanism does not have to be perfect – it can have small flaws. Of course, the higher quality of the sound mechanism, the better the sound is. But even without perfection the flutes can sound great. Next, let’s take a look at some nests with no air channel built into the flute’s body. 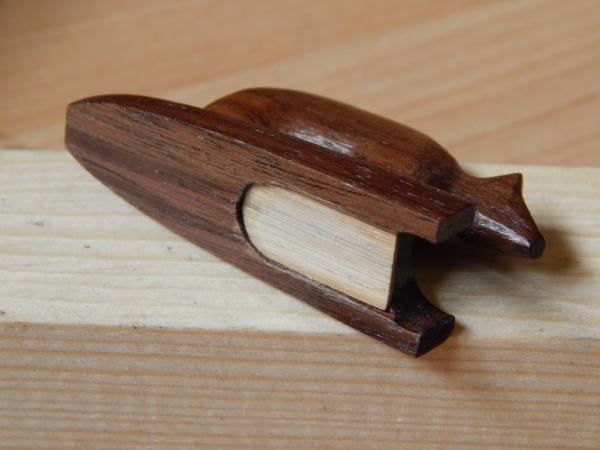 This is a flute I purchased long time ago – this is how Jack Ferguson made the nest in a beautiful piece of walnut. I hope he won’t mind the photo… and the link :). Anyway, many, many flute makers make the holes round – they are very simple to make. But it’s tricky, sometimes such hole produces weak and airy sound. Sometimes, it produces clear and loud sound – I still haven’t figured that out :). Anyway, in case of Jack and his flute, the sound was very loud and clear. The round True Sound Hole has a 45 degrees slope on the bottom. The air channel has been built into the flute’s block. Look below, please. Nest with no air channel, still needs some final sanding of the left hole. This is my own flute made of spruce. The hole leading into the Slow Air Chamber has been drilled and remains rounded. I used a dremel and diamond files to shape the True Sound Hole. In case of Jack’s flute and as well as in case of this flute above, the air channel is made into the flute’s block, and the splitting edge is not sanded down on the top.
! (aff) With its cutting bits it’s a perfect and fast tool to make high quality true sound hole. I own a basic Dremel 3000 and it works great! While I still use a lot of handtools, and finish the TSH with diamond files, the basic cuts made with dremel or some similar tool are very helpful. 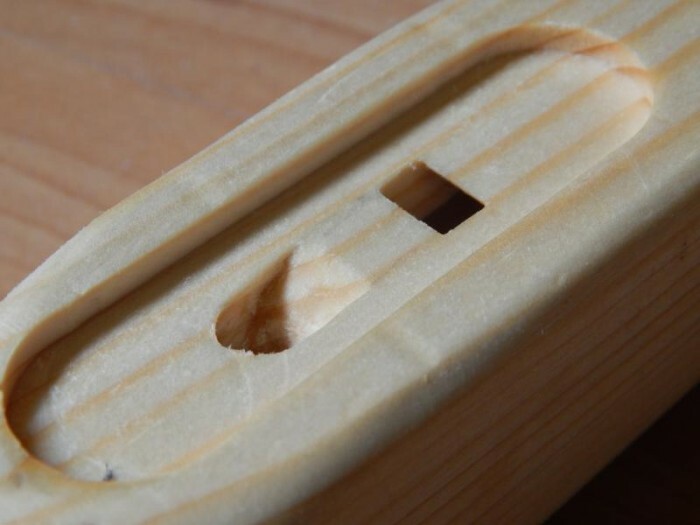 When you make your air channel into the flute’s block, there’s no need to sand down the splitting edge on the top – it should remain intact with the slope on the bottom side only. 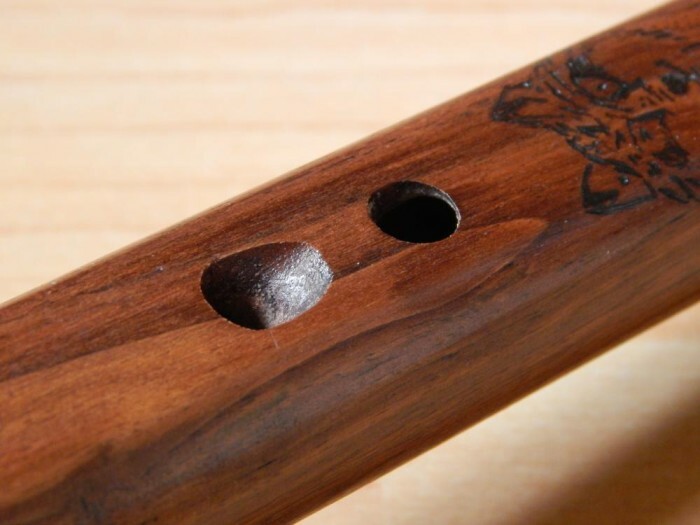 This way, when the hole has proper size, the sound of the flute will remain loud and clear. For those who wonder: on the photo above the True Sound Hole is 6 by 9 mm, and it’s a flute with 20 mm wide bore in the key of F#. Personally, I never had the need to make my TSH bigger or smaller – most of them vary from 5×8 mm to 6×9 mm. Remember – the bigger the flute, the bigger the TSH; on the other hand the smaller the flute, the smaller the TSH. After making dozens of flutes, I’ve noticed that building the flute’s air channel into the block makes tuning process a lot easier, and allows the maker to produce much louder and clear flutes a lot easier. There is some math to making flutes, but when you simple copy the nests from above and make a 45 degrees slope on the bottom of the TSH, the flute should make a sound. 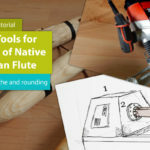 The sound mechanism of the Native American flute may look complicated and difficult to make, but after first few flutes it becomes very simple! If you’re a maker, how do you make your nests and sound mechanism? Share your thoughts in the comments, please. 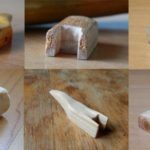 I have read all your blogs on flute making and enjoy very much. I have made a few and all my nests have been with the flu in the body. I am going to experiment with some different styles. I am also VERY interested in your branch flute blogs. I have several branches drying and can’t wait to start. Do you have the fifth blog out yet? Leo, thanks for the comment – sadly, my Disqus offered me no notification and I almost missed it. 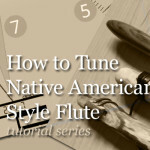 It’s been busy time for me, but I’m going to post the final tutorial on tuning the flutes first, and next the fifth tutorial on branch flutes should be ready, as well :). Hi, I recently purchased at an estate sale a Donald “Duck” Coolidge Native American flute but missing the block. . It is the “Nests With No Air Channel” Type. What kind of block goes on this flute. I have made flutes and blocks before but this is an oval top with no carved out between the sound holes . Thanks! Allan, if there is no air channel in the nest, then the air channel must be placed in the block itself. Just grab a piece of wood, long and wide enough to fit the nest, and use a chisel to carve a shallow channel in the block. Here’s an example I quickly found on my hard drive – the air channel has been routed with a flat router bit in the block. This block has been made by Jack Ferguson. I made a block with a channel in it when I bought the flute. Chiseled by hand, I dont have a router. bottom of the biock so that I get a tight fit and the air doesn’t escape. The one I did make does play but is weak. unless there is another way to make the block fit to the flute. I also chisel blocks by hand :). If the flute plays weak, then first two things to check are, as you said, the tightness and fit between the flute and the block, and secondly, the depth of the air channel – if it’s not deep enough, too little air will flow. On the other hand, if it’s too deep, the flute will sound airy. Another possibility is that splitting edge has been made for a different type of block. For example, one with wings on both sides of the True Sound Hole, or the one with the front wall made at an angle, either tilting towards the splitting edge, or tilting away from it, towards the mouthpiece. Try these ideas and let us known if it helps :). I will use the index card to determine height and length maybe. Great photos and explanation. 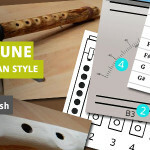 I’m now making flute #1. I have worked with wood since 1952 so have some knowledge there. But zero experience with musical instruments. We’ll see how it goes.